There are 5 Assisted Living Facilities in the Utica area, with 2 in Utica and 3 nearby. To help you with your search, browse the 5 reviews below for assisted living facilities in Utica. On average, consumers rate assisted living in Utica 5.0 out of 5 stars. Caring.com has helped thousands of families find high-quality senior care. To speak with one of our Family Advisors about assisted living options and costs in Utica, call (855) 863-8283. Located in the center of the state in the heart of Mohawk Valley, Utica, New York is a scenic city with a population of around 61,100 people. Although the number of younger residents is growing, the area still is home to eight assisted living facilities (ALFs), six of which are located in the nearby communities of New Hartford, Clinton, Mohawk, Middleville and Herkimer. Licensing and regulation for ALFs in Utica and the rest of the state are the responsibility of the New York Department of Health. Seniors who like snow will love Utica, as the city gets a whopping average of 90 inches per year (the national average is just 26 inches). Rainfall is also a little higher than average (42 inches on average versus an average of 39 inches). Annual temperatures range from 13 degrees Fahrenheit to 82 degrees Fahrenheit. Overall, Utica’s climate yields a Sperling Comfort Index of 43 out of 100, lower than the average of 54. Air quality in Utica, New York stands at 60 out of 100 based on the EPA’s National Air Toxics Assessment. That’s just slightly better than the national average of 58. While the risk of developing health conditions like a respiratory disease is higher in Utica than it is in the rest of the metro area, it’s lower than the risk for the state. Utilities are expensive in Utica, New York (about 12 percent higher than the national average). But because housing in Utica costs less than half than the national average, the city boasts an overall cost of living of just 84.7. In Utica, both property crime (which is rated 55.8 out of 100) and violent crime (which is rated 56 out of 100) are higher than the national averages of 38.1 and 31.1, respectively, state averages of 19.2 and 30.9, respectively, and metro averages of 38.9 and 36.9, respectively. These crime rates make Utica a less desirable choice for seniors choosing an ALF when it comes to safety. Culture and entertainment venues for seniors and their families include options such as the Utica and Oneida County Farmer’s Markets, Stanley Theater, Adirondack Scenic Railroad and Munson-Williams-Protor Art Institute. There are also festivals (e.g., The Great American Irish Festival), a zoo and a venue that hosts hockey games. Utica is home to world-class medical facilities, including the Mohawk Valley Health System, in the event of medical emergencies or illness. Assisted Living costs in Utica start around $0 per month on average, while the nationwide average cost of assisted living is $4,000 per month, according to the latest figures from Genworth’s Cost of Care Survey. It’s important to note that assisted living rates in Utica and the surrounding suburbs can vary widely based on factors such as location, the level of care needed, apartment size and the types of amenities offered at each community. 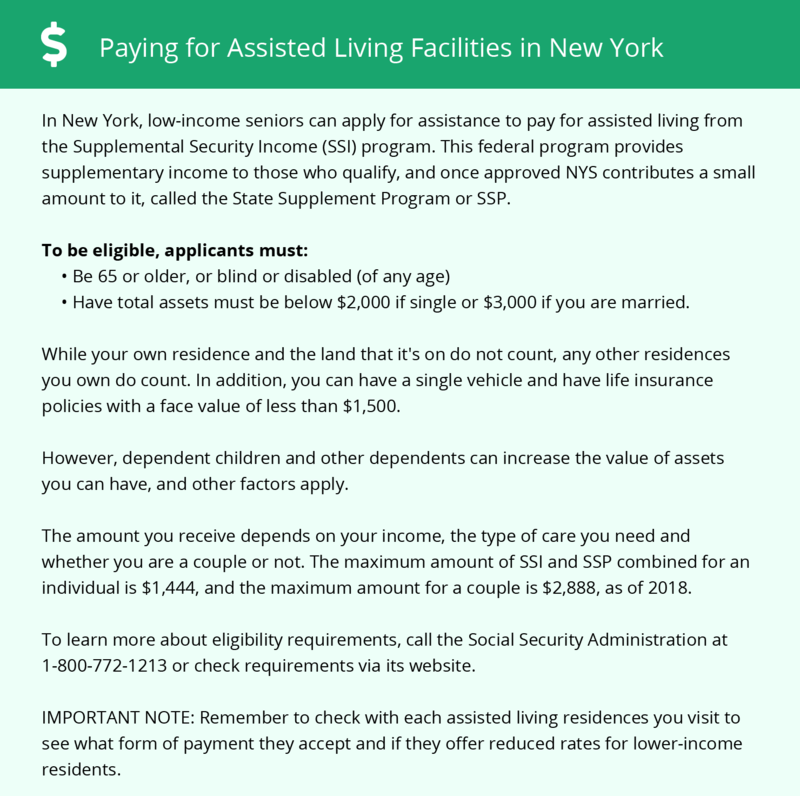 Utica residents can get help paying for ALF services through an optional state supplement (OSS) to SSI recipients, the Long-Term Home Health Program 1915(c) Waiver program and the Assisted Living Program. Utica and the surrounding area are home to numerous government agencies and non-profit organizations offering help for seniors searching for or currently residing in an assisted living community. These organizations can also provide assistance in a number of other eldercare services such as geriatric care management, elder law advice, estate planning, finding home care and health and wellness programs. To see a list of free assisted living resources in Utica, please visit our Assisted Living in New York page. Utica-area assisted living communities must adhere to the comprehensive set of state laws and regulations that all assisted living communities in New York are required to follow. Visit our Assisted Living in New York page for more information about these laws.